The items and seeds here are one of the recipes I use for sprouting seeds for birds, one of many I will be sharing over time. You can purchase smaller or larger amounts of seed and items to suit your needs. The hardware is readily available from your supermarket. The seeds can be purchased loose, in any amount, from your local seed and grain store or stock feed supplier. The picture below shows a mixture of beans and seed sprouting that I feed to my Red Rump Parrots, but the article is based on a recipe for sprouting a seed mix for canaries. 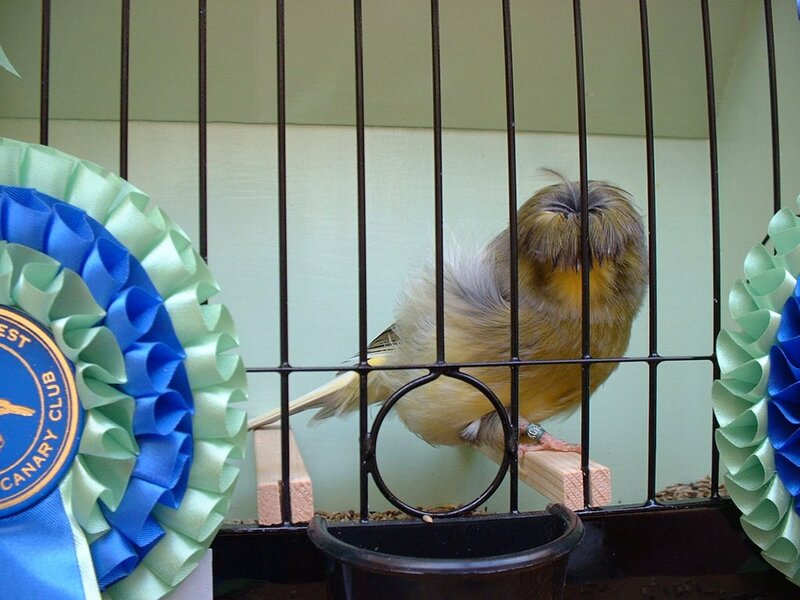 A club member with much more experience than I, introduced me to sprouted seeds when I first started keeping canaries. In all the time I have been using sprouted seed I have lost only three birds when going through the molt. These were all older birds. 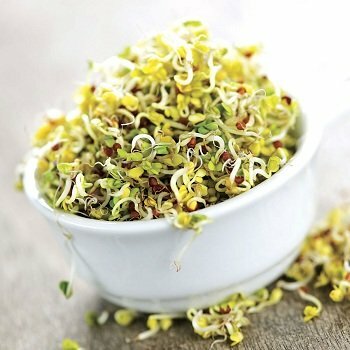 Sprouted seed is relished by canaries; it’s easy to make, it’s high in protein and, in my opinion, can not be beaten as a food addition for feeding to birds with nestlings and young chicks. I further believe it is essential to feed sprouted seeds to birds going through the molt. I feed it to all my birds all year round in various amounts, depending on the time of year. 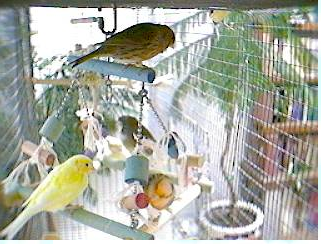 My birds are fed more sprouted seed in the breeding season (they have babies to feed as well as themselves) and the molt period, (a very stressful time for canaries) than at other times of the year. You can soak and sprout most any seeds but Do Not Soak Linseed, Linseed is high in oils and should not be soaked but fed in its natural form. A Stainless steel fine mesh strainer sized to suit your needs. I find the 7-5/8 inch is just right for my needs. They are not expensive so buy a couple of these; they come in handy. A container to hold your sprouting seeds. When I first began sprouting seeds for birds, I read many blogs and watched a lot of videos and the one thing most of them had in common was trying to sell me something that I eventually realized I didn’t need!! Please don’t waste your money on specialized sprouting gadgets!! Instead try an empty ice-cream container of whatever size suits your needs, I find the 1/2 gallon just right for my needs but should you need a larger container you can use a 1 gallon ice-cream container, (These are free once the kids have eaten the ice-cream:-) or you can purchase large plastic storage containers with lids. The size depends on the number of birds you have to feed. A portable shower attachment. Not really essential but helpful. A good avian disinfection. Recommended. And of course a seed mix of your choice. These are the seeds I use, but you can use whatever you prefer for your birds. (Except Linseed) – Links to exactly what I use can be found here. Take equal measures of each. Mix as much or as little as you wish; it can be kept dry stored in a plastic container with a lid. (I usually mix a full plastic rubbish bin at a time.) You can take from the dry mix seed bin any amount to suit your needs for sprouting. Next, I use a 7-5/8 inch non-slip, heat-resistant handled strainer with very fine stainless steel mesh (so tiny seeds won’t fall through). You can purchase these at any supermarkets cooking utensils department, and they last for years. 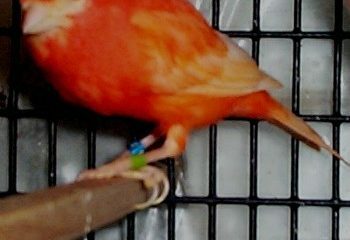 You can order one just like mine from the recommended bird products and gear section. They come in various sizes so purchase a size to suit your needs. Better still, buy a couple, they always come in handy. I fill the strainer with four cups of the mixed seed, leaving about 1.5 inches of space at the top. These 7-5/8 inch strainers will hold six to six and a half cups of dry seed, but if you fill the strainer to the top you will have a problem. After the seed has soaked it swells, it has to be returned to the strainer to be drained of excess moister, so when measuring your dry seed mix in the strainer don’t fill the strainer to the top, fill with four cups. Leave space at the top. Next: Place the measure of mixed seed into your container. Use a recycled ice-cream container big enough to cover all the seed with water. For four cups of dry seed mixture, I use a 1/2 gallon ice-cream container and find it the ideal size for my needs. Now, use a measuring jug to measure the amount of water you use to cover the seed. You will need to know the amount of water used to cover the seed so that you may add the correct amount of disinfection to the water covering the seed. To the water and seed I add a measure of disinfection based on the manufactures recommendations and give it a good stirring through the water and seed, I use my finger for this. I use AviClean (link to order here) My Australia friends use Aviclens from Vetafarm, this is an avian disinfection and they use it not only in sprouting seed water but also in the bird’s drinking water, 1 teaspoon to 2.5 gallons (5ml to 10 Litres) of clean drinking water. This reduces the growth of Algae, Fungi, and Yeasts in the water and, the water stays clean and fresh. Used with seed sprouting, it slows down the fermentation process during seed soaking, thereby reducing the risk of bacterial contamination of the seed, making it safer for breeding birds and nestlings. Leave the seed covered in water for at least six hours. After one or two hours, check the seed and top-up the water, you “do not” have to add more disinfection. I usually start soaking my dry seed mix at around 9 pm and leave till 9 am that following morning. A lot of the water will be absorbed into the seed causing the seed to swell. After the soaking the seed all night, I pour the soaked seed and the water through my strainer\sieve, draining off the water leaving the seed in the sieve. The seed will have swollen and filled the strainer almost to the top. That’s why I never fill the strainer to the top with dry seeds. I leave room for the swollen seed to be returned to the strainer for draining off excess moister. 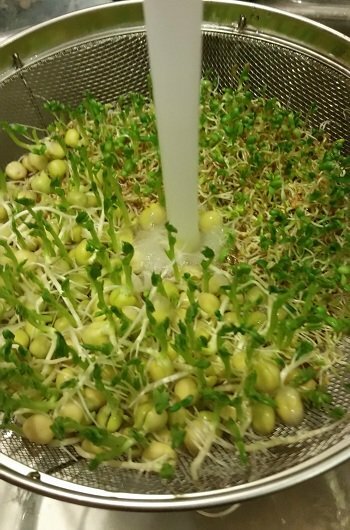 If you have made too much sprouted seed for the strainer simply use a second strainer to hold the excess seed. I then use a shower attachment fitted to the cold tap and thoroughly rinse the seed in the sieve. If you don’t have one of these portable showerheads just use the gently running water from your tap to give the seed a good rinse. After rinsing, leave the seed in the sieve to drain off all excess moisture. This will take a few hours. I usually leave the seed in the sieve overnight to drain excess moisture. The following morning I set the sieve with the seed onto paper towels, and cover paper towels, this will soak up any remaining moisture from the bottom of the sieve, By noon that day, the seed is ready to be fed to your birds. Whatever way you do it, the seed should be thoroughly rinsed and left to drain off all excess water. When you finish, your seed will look like the seed in the photo. You may need to use a magnifying glass to see the seed starting to sprout. 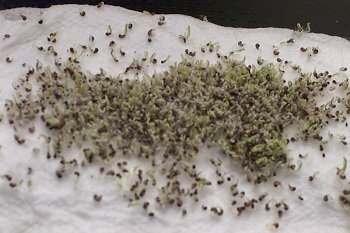 The seeds in the photo have been drained for eight hours and they are just beginning to sprout. 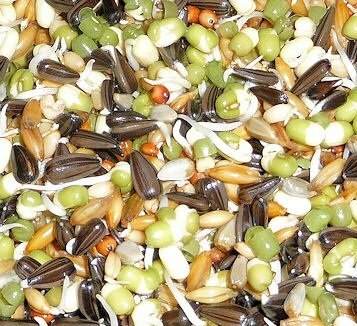 This is when the sprouted seed is at it’s best for your birds. 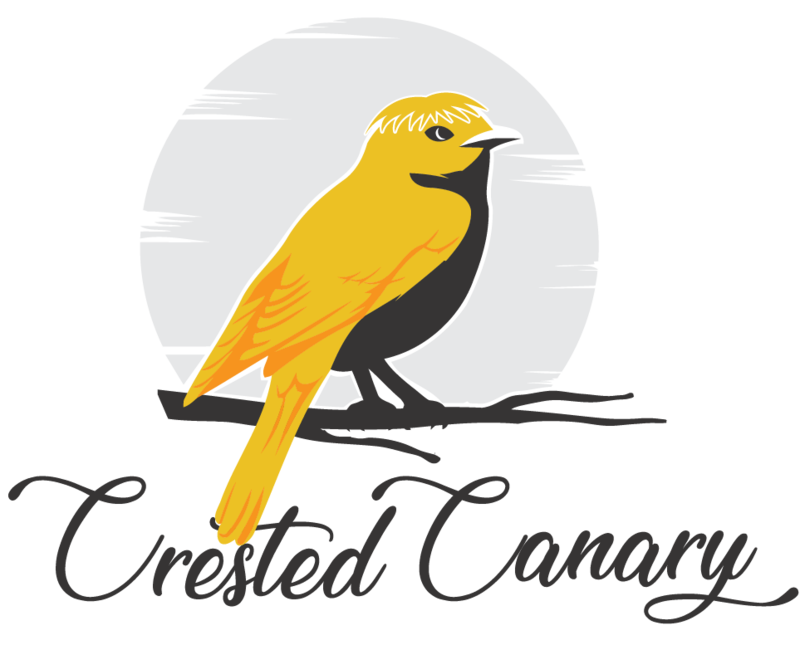 It is now ready to feed to your canaries. Place the seed back into a dry 1/2 Gallon ice-cream container for storage. With the lid in place, it can be stored in the fridge between daily feeds. 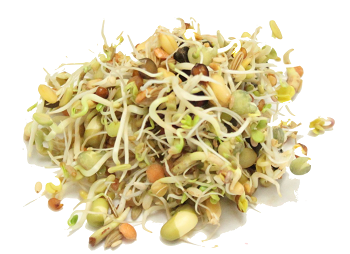 Feed the sprouted seed to your birds every day during the breeding season and when your birds are molting. For more than ten years I have fed sprouted seed as a supplement to my birds all year round, it’s great for the bird’s health and they love it. 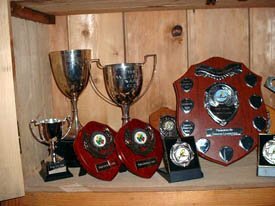 Good Luck with your efforts in the fancy and may you breed even better birds this season with the help of sprouted seed.